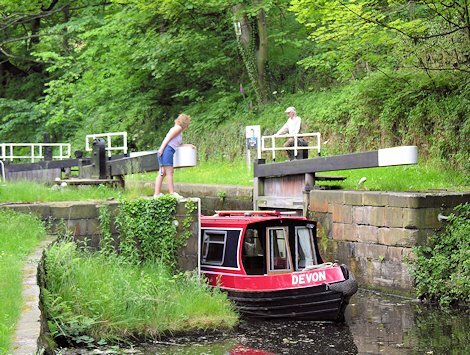 Go through the next two locks on your own, and discover how simple it really is. Moor for the night in Mytholroyd, with two pubs, a charming vegetarian cafeé, and two convenience stores. Sail off to Hebden Bridge. This old mill town nestles in a fork in the hills, houses piled tier upon tier. 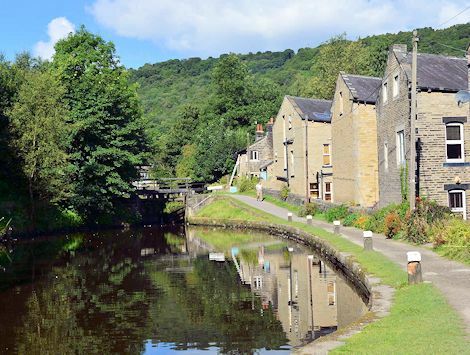 Hebden is the original plastic-bag-free town, and has not succumbed to a big supermarket, so has an amazing variety of shops, cafes, restaurants and pubs. It's full of surprises - everything from horsey clothing to hand-made pottery, and not one but two bookshops. 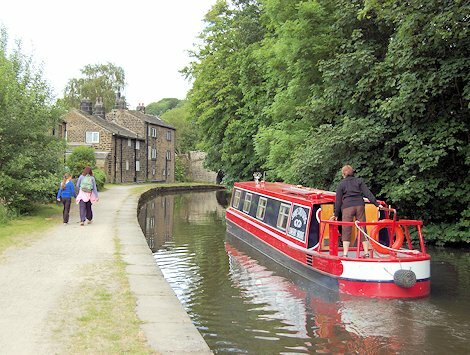 Turn below Lock 15, then go back to moor in Hebden itself. This is more of a serious boating day. 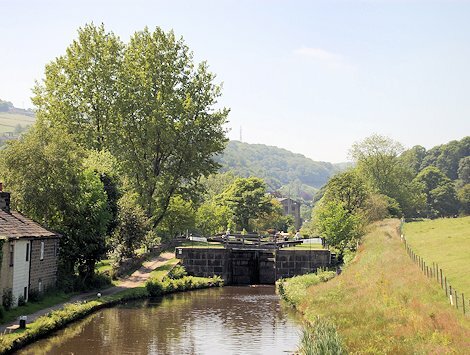 You need to have booked passage through Tuel Lock (in Sowerby Bridge) the previous day. 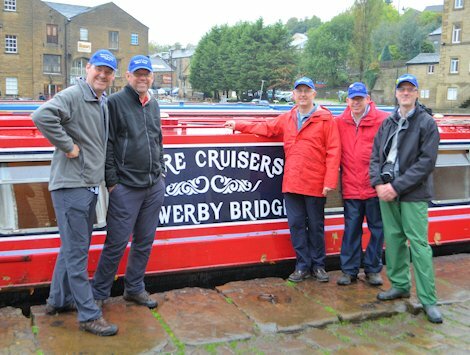 Pass the boatyard in Sowerby Bridge, and carry along the side of the hill to Salterhebble. The top lock is just beyond the steel railway bridge. These locks are shorter than you're used to, but there's room for our longest boats. You use the special handspike supplied to work the paddles. Carry on down the side of the valley, with views of lakes, woods and the river, stopping for lunch in the Barge & Barrel at Elland Wharf, admiring the new bridge as it takes shape. Eventually arrive in Brighouse, turn at the water point, then moor for the night. Lots of pubs and some very good restaurants. Not a long boating day, to give you time to get the bus into Halifax to visit the Piece Hall or Eureka! At the top of Salterhebble Locks, turn right and go round the corner to spend the night outside The Watermill (and the evening inside). A nice sail back to the yard, with striling views of the hills through which you travelled earlier in the week. Hand the boat back by 9am, please.